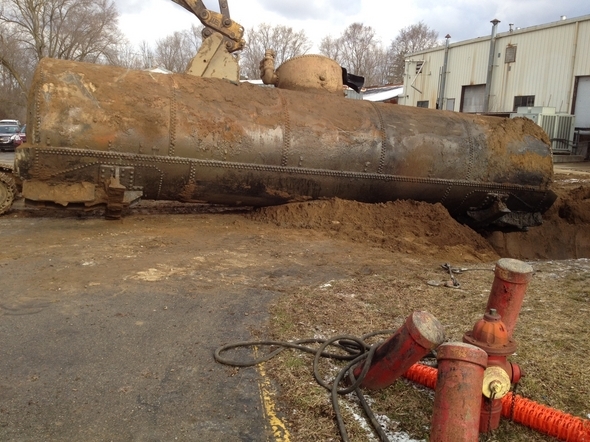 Posted on Wed, Mar 14, 2012 : 4:22 p.m.
Workers unearthed this rail car at an industrial site in Dexter. 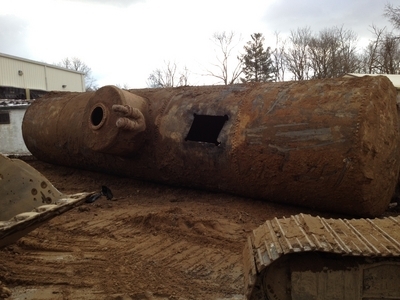 Crews recently uncovered a 30-foot-long rail car that was buried for decades at an industrial site in Dexter. 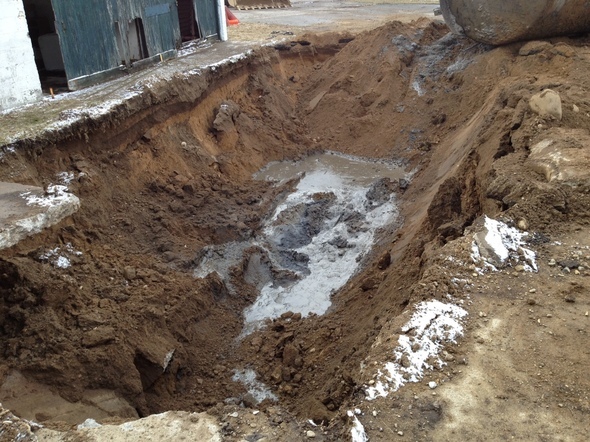 This photo shows the rail car being excavated. This photo shows the excavated rail car, which was about 30 feet long. Workers unearthed the rail car from land next to an industrial warehouse at 7931 Grand St. at the corner of Baker Road. "We knew it was there, but we didn't know where it was, so we dug it up," said Swisher Commercial real estate agent John Evans. "It was kind of like a treasure hunt and this is what popped up." Evans said the rail car was unearthed because developer A.R. Brouwer Company LLC has reached a contract to purchase the property and use the 118,000-square-foot warehouse for storage space to compensate for the construction of the new Dexter Wellness Center across the street. Photos taken after the rail car emerged last week show the cylindrical car caked in mud from several decades underground. Evans, who is representing Brouwer in the deal, said it's unclear which industrial user buried the rail car, but it's believed to date back to the 1930s or 1940s. Evans said the rail car was used to store fuel that was burned to heat the industrial plant, which was occupied by a number of companies during the 20th century, including Sweepster Attachments and Pilot Industries. Brouwer — which is purchasing the site from Katie Davis, who recently inherited the 5.5-acre property, Evans said — used two excavators to extract the rail car from its resting place. Evans said an environmental cleanup contractor followed state regulations during the cleanup, which also involved a special process to clear the rail car of oil and water. The rail car was hauled off to a scrap yard. "Here's what you find sometimes in a small town," Evans said. "It's something you just don't see." This photo shows the spot where the rail car was excavated. Mon, Mar 19, 2012 : 2:23 a.m. It's a shame that they scraped it. I would be that the Greenfield Village or one of the other Railway museums in Michigan would of loved to have it. Fri, Mar 16, 2012 : 8:18 p.m.
Boxcars, coal cars, oil cars and flatcars are all illustrated in the story The Little Red Caboose, but the illustrator gave the impression they were at most 15 feet long. Top Cat, I did see a red caboose resting on a strip of railroad track in the front yard of a house, less than 20 years ago; it didn't sit right in front of the house, but was to its right, in Webster Township, and that house sat well back from the road, so a lot of motorists could pass it without noticing the caboose. What business did I have going there? I was delivering phone books to residences and businesses on that postal route, told to put them right on doorstops, not thrown into yards or put in mailboxes. I didn't see that caboose as a lawn ornament, but thought the homeowners were history buffs. Some houses in Dexter have front and back driveways, to both Dexter-Ann Arbor and Dan Hoey Roads. A house on Merkel Road (Zeeb Road turns into it at its north end) may have a back driveway to Donovan Road. Still other such homes are in Superior Township. If you live in such an area, you could have a train car in a back lawn, visible to some motorists, but they would not be able to see your ADDRESS! So that's where I left it! I've been looking for my rail car for decades. Now if I can only find my car keys. Thu, Mar 15, 2012 : 5:22 p.m.
Thu, Mar 15, 2012 : 5:28 p.m.
Thu, Mar 15, 2012 : 3:16 p.m.
Thu, Mar 15, 2012 : 12:59 p.m. So that's what happened to the Super 8 alien. Thu, Mar 15, 2012 : 12:54 p.m.
Thu, Mar 15, 2012 : 12:16 p.m. So really the company didn't do anything nefarious, they just repurposed a sealed-tank railcar as an underground storage tank. Thu, Mar 15, 2012 : 1:19 a.m. Wed, Mar 14, 2012 : 11:14 p.m.
Thu, Mar 15, 2012 : 2:09 p.m. Thanks, now I have that whistle tune in my head. Mulder? I debunk your theories. Wed, Mar 14, 2012 : 11:08 p.m. I thought it looked like an oil car. I didn't realize that oil cars could be 30 feet long. Wed, Mar 14, 2012 : 9 p.m.
here I thought we might get a Hoffa connection! Great thought for today. You never know what you will unearth once it is dug up. Wed, Mar 14, 2012 : 8:50 p.m.
Ah the good old days. If only the Government bureaucracy would get out of the way of private enterprise I'm confident they could kill all the fish in lake Erie and set the Cuyahoga River on fire again in no time. That would be the goal wouldn't it Craig? 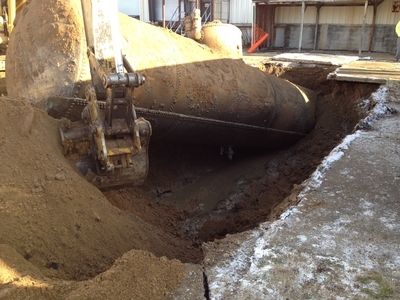 Wed, Mar 14, 2012 : 8:29 p.m.
Back then, one could imagine just buying an old tank car instead of a new, purpose-built underground tank. Nowadays, of course, that wouldn't fly environmentally.